So I started taking my statin. Several weeks later while playing competitive basketball I tore my calf muscle. I screamed in agony. I could not even walk off the court. I was not even playing that hard when the muscle tore. I had heard countless patients tell me how statins made their muscles hurt. To be honest, like most cardiologists, I wasn’t convinced so many of them were having side effects. That is until I tore my calf muscle. It took several weeks for the muscle to heal. I suspected it was the statin and so I stopped taking it like many patients who are prescribed this medication. I thought I would just take my chances. Playing basketball was so important to me at the time that it was not worth risking injury to take a drug. As I have gained an awareness of the healing effects of real food, real living, and real happiness I have started to question why some cultures in the world can avoid heart disease. In cultures and regions of the world where they can keep their total cholesterol naturally low (without medications), below 150, blockages in their arteries are just not seen. These people rarely have heart attacks, their stroke risk is very low, and they are much less likely to develop dementia or other diseases with aging. I should mention that this target of 150 mg/dL is far below what the American Heart Association (AHA) would classify as “normal”. The AHA goal level for total cholesterol is below 200 mg/dL. It has often been said in cardiology that you are only as old as your arteries. How true this is. If you can keep your “pipes clean” you will live a long and healthy life. Please do not ever stop a medication on your own. If your physician has prescribed a cholesterol lowering medicine for you, please continue to take this medication. As you make the necessary lifestyle changes to lower your cholesterol, you can have your cholesterol checked again in 2-3 months. If your cholesterol has come down significantly, talk with your doctor about reducing or eliminating cholesterol lowering medications. Unfortunately, half of all adults in the U.S. have a total cholesterol above the goal level of 200 mg/dL. While cholesterol is by no means the only cause of cardiovascular disease, it is one of many risk factors that need to be controlled to live a life free of chronic diseases. Personally, I have never seen a heart attack or coronary artery disease (cardiac plaque build up) in any patient who is physically fit and has a total cholesterol of less than 150 mg/dL without medications. The same lifestyle that naturally leads to a low cholesterol is the same lifestyle that can allow us to avoid the chronic diseases of “aging”. Too often, the approach in the medical community is to just prescribe a statin. I know, I was trained in this environment. My mentors shared with me that few, if any, patients can make life lasting changes. Thus, just prescribe a pill. How do we keep our arteries free of plaque build up? While genes do play a role in some people, for most of us the choice is really up to us. By not smoking, exercising regularly, maintaining an idea body weight, eating real food, keeping our blood pressure under control, and by keeping our cholesterol in check we can slow the aging process and prevent heart disease. How serious of a problem is cholesterol? As Americans we are doing a better job at controlling our cholesterol. The average total cholesterol in the US has dropped from about 220 down to about 200 over the last one to two decades. With this, there has been a sharp drop in heart attacks, stents, and coronary bypass surgeries in the US. Personally, I think the real goal should be to be physically fit AND have a total cholesterol below 150 naturally if we really want to finally end heart attacks. Most of this reduction in total cholesterol in the US has been by eliminating most transfats out of our diet. Transfats are primarily found in unhealthy oils and processed foods. Thanks to new laws now in place, the FDA has baned transfats from our food supply. The only problem is that this law will take some time before it is in effect. Until this new transfat ban kicks in, you can still find transfats in processed foods. According to US law, if there is less than 0.5 grams per serving, food manufacturers can list “zero transfats” on their labels. This is not right and is very deceptive to people. If you consume a lot of processed foods you could easily pick up a few grams of this incredibly toxic and artery damaging fat. How do we avoid transfats? Read the labels very closely if you eat anything processed. Anything that says hydrogenated or partially hydrogenated should be avoided. If you eat out, fried foods usually have transfats. At home, only use the healthy oils like extra virgin olive oil. If your cholesterol is too high, do not despair. It is easy to bring it down! Here are 5 simple ways for most people to get their total cholesterol below 150 naturally. Regular physical activity lowers your LDL (bad cholesterol) and raises your good cholesterol (HDL). Cholesterol is only found in meat and dairy. You do not need any cholesterol in your diet. Your body will make what ever your body needs. Fish is relatively neutral overall to cholesterol. While fish does slightly raises LDL (bad cholesterol) it also raises HDL (good cholesterol) and lowers your triglycerides. Fish, especially oily fish, is very heart healthy provided it is a fish low in mercury and other contaminants. If you enjoy animal meat, eat only organic grass fed meat and in limited quantities. Fiber scrubs the cholesterol out of your body. The more fruits, veggies, nuts, seeds, and legumes (beans and lentils) the better. Nuts and seeds have the healthy fats our bodies need. For cooking, stick to healthy fats like extra virgin olive oil. Margarine, vegetable oils, or anything like this is toxic to our bodies. This is where most of the chronic diseases we are now seeing come from. This is not real food. Stick to real food not stuff made in a factory and sold in a box, can, or jar. Since completely changing my lifestyle, I have been able to drop my total cholesterol from 211 mg/dL to 118 mg/dL without any medications. I am 100% medication free at this point in my life and feel great. You cannot see this degree of cholesterol lowering from statins alone. Many physicians do not even feel this is possible but it is. I have many patients who have dropped their total cholesterol more than 100 points from lifestyle alone. We underestimate the power of a healthy lifestyle! One point to always remember. Please work with your physician when lowering your cholesterol naturally. You never want to just stop your medications. How is your cholesterol? Have you had it checked recently? What are you doing to keep your total cholesterol below 150? You can leave a comment by clicking here. Could you please share the research data which led you to state that fiber scrubs cholesterol out of your body. Here is a good study that discusses the mechanisms by which fiber lowers cholesterol. I have removed animal products from my diet, aside from some fish and occasional egg whites, and have been on a low fat diet for over a year due to some recently learned realities of my genotype. I drink no alcohol and exercise about 5 days per week. Even so, my LDL has gone up (150)?? It’s difficult to find a cardiologist trained in genetics and and a functional approach to prevention, so I was happy to find your blog. Any insight as to what else could be the issue here? I thought for sure my LDL (and particle size) would improved given my drastic lifestyle changes. Any thoughts would be appreciated. Sorry to hear about your challenges. Most people eating like you would have a very low LDL. That said, there are likely genetic issues at play. I would suggest working with a preventative cardiologist for further testing/treatment to get your LDL to a better number. Typically it takes a few months before you see the full effects of cholesterol lowering with a healthy diet. Stay tuned on this as there have recently been several key new studies published that I will be reviewing in upcoming blogs. If you are subscribed to my newsletter then you won’t miss any of these upcoming articles. I am a 68 year old post menopausal women who eats a very healthy diet (no processed foods in this house). My cholesterol continues to rise every year. I also have SiADH and must control my sodium/potassium level. I take two salt tablets daily to keep my sodium normal and 10mg of Lasix to allow me to eat a healthier diet. My doctors really want me on a statin and my resistance is very strong. I work out 3 times a week and walk daily and weigh 127 pounds at 5 ft 6 in.. My latest cholesterol was 268 with an LDL of 171. Triglycerides of 73 and an HDL of 82. I do have plaque buildup but no restrictions on blood flow. I’m feeling lost and over whelmed. My gut tells me statins would cause me a lot of issues. So many questions and so few answers. Any hope for me to lower these numbers naturally? Congratulations on your commitment to a healthy lifestyle! While cholesterol in the diet does not play a significant role for most people, for a minority of people it can have a huge effect. For some people, like me, eliminating meat and dairy dramatically dropped my cholesterol. Another approach is limiting saturated fats. For some people cutting back on saturated fats, even saturated fats like coconut oil, can have dramatic effects. As you already have plaque build up the stakes are high in your case. Please work very closely with your cardiologist. I have been following your blog this year and have made significant changes to my diet and daily excercise habits. A recent blood test gave me information that while I am improving my HDL and it is in great shape, my LDL is elevated. I am seeing significant improvement in all of my health and am wondering if continuing with my diet and excercise changes and weight loss will pull that pesky LDL down? Also I am wondering if stress affects the LDL? This year has been notable for me in many ways and stress has definitely been a factor. I still have work to do and I think that the diet and excercise and stress management approach will be most effective for me. How low do I need to be as a 50 year old female to reduce the plaque in my arteries? I really appreciate your blog and information. Please continue sharing your insights!! Thank you so much for reading my blog! I am so glad to hear that your HDL is improving! In general, the lower the LDL the better when it comes to plaque build up within the heart. However, it is also important to remember that there are many more causes to plaque build up than just an elevated LDL. Dietary cholesterol is only found in meat and dairy. Trans fat, which is generally found in processed foods, bakery items, margarine, etc. can have a very powerful effect on LDL. Also, simple carbohydrates can drive the cholesterol numbers in the wrong direction. Stress can also play a role in cholesterol levels. I recently read about your visit to Longevity Village in South China and have been intrigued with the the people and lifestyle. I am 72 years young and am planning a trip to Hong Kong in March to visit my son who lives there. My question to you is how difficult would it be to visit the village? My main concerns are language and lodgings. Are there guides or interpreters that we could connect with? Thank you for sharing you and your families experiences. It blessed me to see your children interacting with the residents of the village. I believe one of the major problems in our American society is a lack of Inter-generational relationships. Thank you again for sharing your insight and wisdom. Thank you so much for your interest in this village. Unfortunately, unless you have an interpreter/guide it is too difficult to navigate as no one speaks English there. I am not aware of any services available. During our stays there we never saw any foreigners. Of course, this could all change in the future. Is it true that fish oil capsules can help in lowering cholesterol? Yes, fish oil can be very effective in lowering triglycerides. Thank you so much for your suggestion! 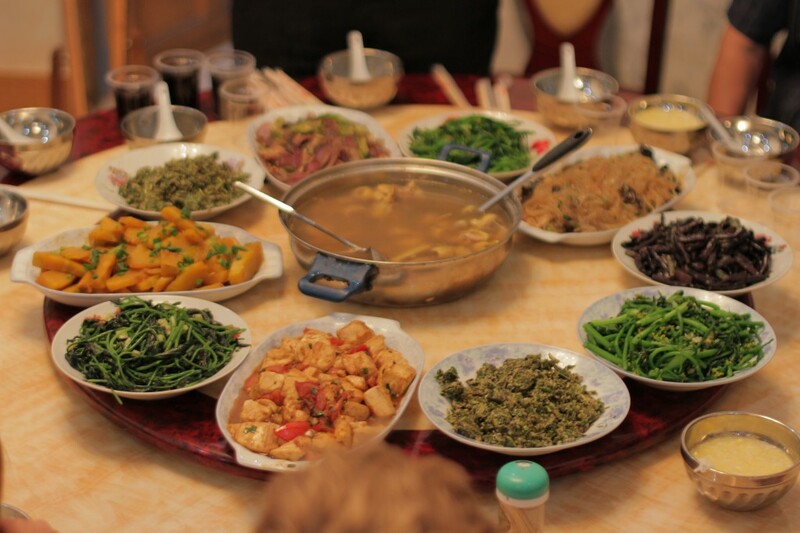 This photo was one of the typical meals that was prepared for our research team in China’s Longevity Village at the small inn where we were staying. There are so many healthy ways to flavor food to make it taste amazing. As we are still learning to cook healthy as well we have been hesitant to share recipes because we generally don’t follow any recipes and often things do not turn out. We will do better and start sharing some recipes and ideas of things that have consistently turned out well for us. I love this idea of sharing recipes, even though I grew up in the Greek culture, many things I learned are not so healthy. As a kidney patient, as with my heritage I learned to use spices, but feel like I need some new ideas. Finally, one doctor who gets the “statin” drug issue! I am not against something that is helpful to a patient but for the medical field to determine what is right for one should be right for all is so closed minded. I simply say thank you for seeing not everyone can tolerate the “statin’s”. I look forward to learning from you ways that may be helpful for those who do not tolerate statin’s. I believe there are better ways than taking statin’s, though for many taking a statin may be a great blessing. I believe in nature and natural ways yet it takes much learning to find the answers or possible answers. I am excited about your experiences with those in China and what your are sharing with those who are interested in learning.